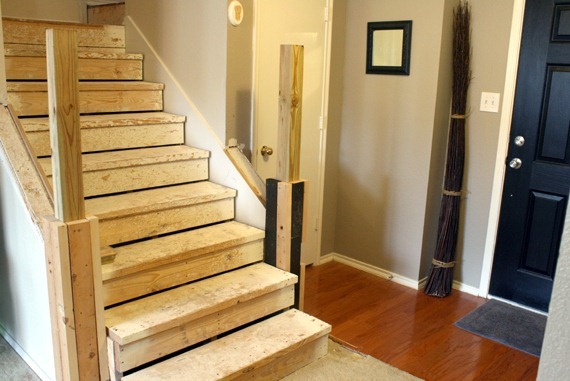 Okay so this budget stair remodel is seemingly the project that never ended… It was one of the first things we demo-ed and one of the last things we wrapped up. The ultimate stair makeover! You can see how it all went down at that link. I do however want to review it a bit for you to see. But anyway, we all need to be reassured that yes, this project ended so here is a sneak peek! Let’s chat shall we, about how we got to this point…The staircase in the entry was one of the things that I liked about this house, but in its original state it made the entry space feel SO SMALL! I really wanted to have an entry space and not just arrive in the living room. I love the idea of entry spaces and it is one thing I really haven’t had in my houses (technically in my first house I had one but it was all doorways so I couldn’t make anything of it). We drew up some plans and sketches of the space. It was important to me that the staircase matched the living room, but that they didn’t compete. Also like I said before I wanted the entry to be it’s own space or a different “room” if you will, so I chose not to add the wainscoting to the walls, but I did carry the base molding through. We were also planning on adding the same door molding treatment and crown molding to the entry (but ran out of time). **TIP: One of the best ways to figure out what you can do with a space very quickly (even for the artistically challenged) is to take a picture of the space and sketch out different alternatives over the image. Here was one of my first goes at sketching out the plan. Then we cleaned it up the plan a bit. A few things obviously changed, but you get the picture. So this monster of a project all started while my husband was away at work… (BAD WIFE!) The stair carpet was crappy to say the least, and I really wanted my staircase to be amazing. So I peeled a corner of one of the steps away to see what was there… and tucked it back in before he got home. Then of course I told him about it, and showed him what I did… I’m not that sneaky! Obviously the project was just a little more than finishing a beautifully built stair, cuz out staircase was a mess! Luckily my husband wasn’t too mad about my little carpet escapade and let me rip off the rest of the carpet. We had very little, if any budget for this project so we tried to work with what was existing, and for the most part we did. The stair runners were just structural 2 x 12’s in case you were wondering. and they were covered with plaster splatters from our much hated wall texture. But we didn’t clean it off right away because of the mess it would have caused. SO instead, we (meaning mostly Justin) started removing the hand railing, which we kept intact so that we could replace them after we made the changes. So, after we had opened up the space by moving the soon to be (ha, ha… two years later) new newel posts back 2 feet. We went about expanding the bottom two stairs to wrap around the soon to be newel posts. So this was the first purchase for this project. I think it was around $50 to get 2 – 8’ 2 x 12’s. 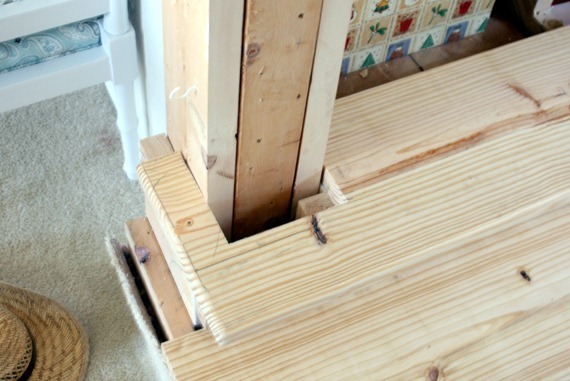 For the actual structure of the bottom stairs we reused any 2×4’s and 2×6’s that we already head. 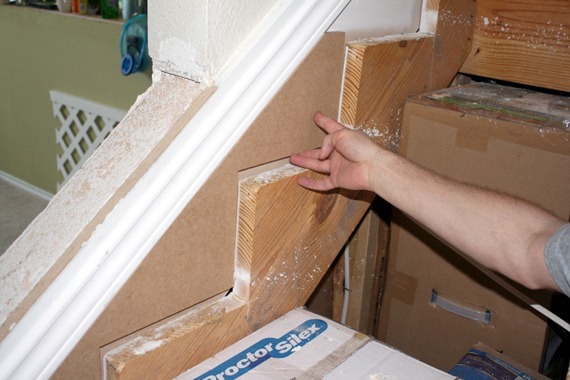 When he installed the new bottom two stairs, he also routed the front edges of the 2×12 on the top and bottom, so that the nose of the stair tread had a more pleasing and looked more finished and less like a 2×12! Then Justin took the time to carefully pry off each glued and nailed stair tread and stand it outdoors and route the front edges. Then he re-glued(construction adhesive) and nailed or screwed them back in place. One of the issues we found when we were replacing the stair treads was a big gap on the both sides of the tread (up against the wall). We didn’t want to cover the gap with strange moldings, because inevitably that would look a little hokey in my opinion. 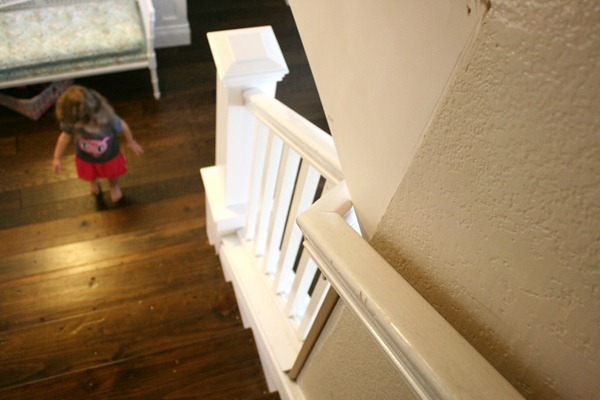 So we thought about our choices and we used our experience with adding a wall stringer after the fact, to the first staircase in our first house (part 1, part 2 and part 3) to fill the gaps. The stair tread covered the seams on the wall stringer and there were no big gaps on the side anymore! Yay! Okay so they pretty much stayed like this for two years, while I had babies and we dealt with life… Remodeling, may be our hobby, but we still have to live. We were waiting on the color of stain choice. We didn’t know what color our floors were going to be, so we couldn’t match it to the stairs. Instead we just waited, after a while we got most of the living room done including purchasing and installing our new flooring. But after having the living room floor done and a second beautiful daughter born (and the use of my body back- thank heaven for a working body!) I got sick of the crappy looking stairs, and decided to go ahead and start the finishing process. Next we cut out new stair risers, painted them white, added polyurethane and glued them in place with construction adhesive (to avoid patching and sanding holes since they were already painted and sealed. We also wrapped up the side of the stairs which were on hold because of the living room design from forever ago. This project of the living room, stairs and kitchen was so much like a life sized 3-d puzzle, figuring it out as you go. Vanna show it off, oh my goodness, Etta was so little… Sweet Girl! Finally Justin built our newel posts and we have a tutorial of how he did that. Finally having a newel post might have had me dancing and praising the heavens! The biggest change associated with the hand railing was wrapping it the unfinished arch. It looked really beautiful when it was done. Especially after I painted it black. Okay, I showed you what changes were happening in the entry so all I have left is to show you the final images of the stairs and entry, but this post is getting so long that I will show you all the finals tomorrow! If you want to see the whole stair process you just need to check out the stairs tag! 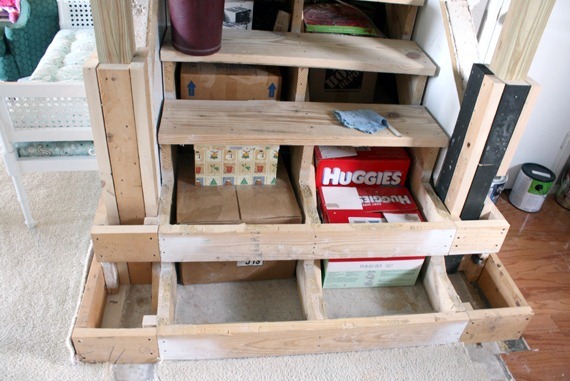 I love this idea, what kind of stain did you use so it will last? Looks lovely! Much better. I like your child gate -is it attached to the banister?how does it open/close? the baby gate was just wedged between the banister and railings. it was more of a temporary thing. We just slid it in and out. I just found this post, your stairs look amazing. Can you tell me what you did on your landings? Which kid of wood did you lay? So what material did you use for your landings? Did you use additional 2 x 8’s? We used the wood listed in this post: https://www.remodelaholic.com/installing-a-floating-wood-floor-living-room-update-part-6/ It was the same as the new living room floor. I built the first edge of the landing with pine wood cut the shape with a nose and the same width as the flooring for the landing. Looks Great!..What kind of board did you use for the risers? Wonderful job. Congratulations. Can you please tell me what material is it that you use to wrap in the base and the post of the large custom newel post you made?